A short stint to this enchanted place in Ireland, where we attended this Olympus workshop and met some of the most talented photographers, was crowned with a nasty cold once we arrived back home. A really nasty one. Thylehogichi, chicken soup and probably a bath tub filled with herb tea were in order, for longer than anticipated. Both on my desk and in my kitchen – logically – my cooking and baking list has developed a massive backlog. Right now I especially crave all kinds of cakes from my childhood. I’ve already tried to compile a list of my very favorite classic cakes, but keep struggling every time. Should Donauwellen be ranked higher than the Raspberry Sponge Cake Roll? Is the Eggnog Bundt Cake more of a classic than The Tipsy, Nutty, Chocolatey Cake? It probably doesn’t really matter, but still, that’s what list lovers do. Right? 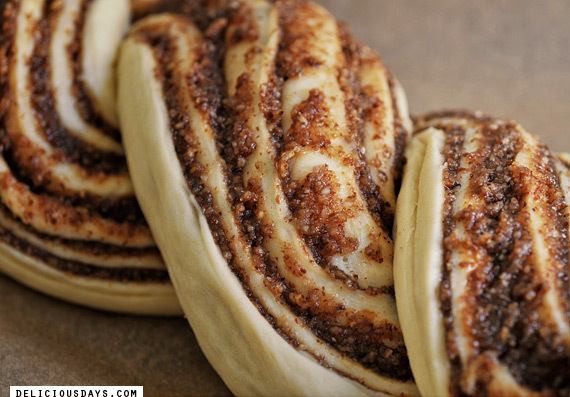 Undisputedly ranking very high on my imaginary Favorite Of All-time Classic Cakes list – probably at 4th or even 3rd place – is this classic nut braid. I use my grandma’s recipe for a soft yeast dough (very sticky to handle, but absolutely worth it) and have experimented with the nut filling for the last years, and I think I found my favorite. Don’t be put off neither by the long list of ingredients for the filling (they make for a well-rounded flavor) nor by the braiding process, it took me numerous bakes to reach the state where it looks neat and even. 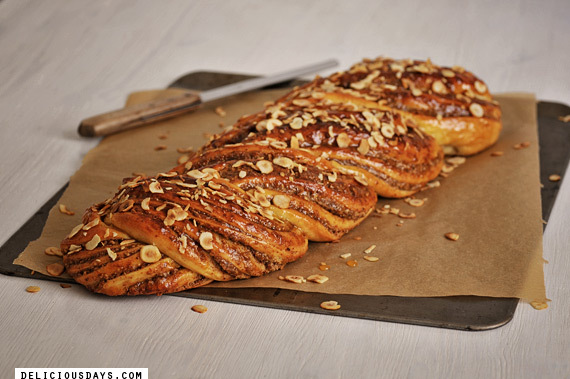 Then this nut braid will make it onto your favorites list, too. Promised! Just keep in mind – crucial for a perfect result: Don’t be afraid of sticky dough. Don’t skimp with the kneading. Don’t overbake it. Heat the milk in a small pot until lukewarm, then remove from stove. Sieve flour into a bowl and make a depression in the middle. Crumble the fresh yeast into the center and pour about 1/3 of the milk over it. Cover bowl with a kitchen towel and let the pre-dough rise for about 15 minutes, until slightly bubbly. Cut the butter into cubes, add it to the rest of the milk and heat just until melted, then remove from heat. Add the remaining dough ingredients and beat well (I use a KitchenAid with dough hook on 4). This dough will be very sticky and NOT clean the sides of the bowl by itself, but 5 to 7 minutes of kneading will improve the texture a bit (if you are afraid of sticky yeast doughs, you can add 1 or 2 tablespoons of additional flour within the first minutes). Scrap it onto a well-floured work surface, shape it – with floured hands – into a ball and put back into the floured bowl. Cover bowl with a kitchen towel and let the dough rise in a warm spot for 1 hour or until doubled. Start by roasting the nuts together with cinnamon, cloves and nutmeg in a wide pan until golden and fragrant (don’t be tempted to do anything else at the same time, nuts burn fast, turn them constantly!). Next heat the milk, butter, chopped marzipan, brown sugar and salt in a small saucepan and stir until marzipan and sugar have dissolved, then remove from heat and add honey, liqueurs and finely grated zest of half a lemon. Pour over the nuts, combine with a spoon until a smooth paste forms and let cool for 5 to 10 minutes before spreading it onto the dough (it thickens as it cools). Waiting longer will result in a rather dense paste, that is hard to spread (emergency rescue: add a little milk). Line a baking sheet with parchment paper. Beat egg and milk in a small bowl and set aside. Scrap the risen dough onto a well-floured work surface, use your hands to press and pull it into rectangular shape, then roll it out with a rolling pin (~35 x 35 cm, ~14 x 14 in), dusting with flour when necessary. Gently and evenly spread the nut paste onto the dough, leaving a 2 cm edge all around. Roll up and carefully transfer to the baking sheet. Now on to the more delicate part! Cut the roll in half with a large knife, but be sure to leave the top 5 cm/2 in intact. Key is it to braid the two strands not only around each other, but to always place the cut side upwards. As always, the more often you bake this recipe, the neater the results will turn out! Lastly tuck both ends under, this helps to give it a clean and plump look. Brush it generously with the egg milk, start with the dough parts, then the filling. Now preheat the oven to 180°C while the braid gets its final rise (20 to 30 minutes). Bake on middle level for 30 to 34 minutes. Meanwhile prepare the nuts and glaze: Mix the apricot jam (press through sieve first, if chunky) and 1-2 tablespoons of water in a small pot and heat shortly until smooth and runny. Roast the nuts in a pan until golden. Remove the braid from the oven and generously brush with the apricot glaze. Sprinkle with the roasted nuts and let cool until cutting the first slice. Tastes great the next day, the day after that and even three days later (well covered). Is there a better way to start a Sunday morning...? I adore this kind of bread! This aromatic fill sounds magnifique! Wow. That is a work of art. Love the texture, the colour, the overall presentation of it. With rum and amaretto, and the whole lot of nuts and spices,I think you are right. It it's THE nut braid. You two must have had an amazing time in Ireland. That scenery! Your nut braid is both traditional and beautiful (and so neat!). I need to make this German version soon as I haven't had it in a long long time... At home I mostly stick to the cardamom flavored Scandinavian buns and braid loaves. I'm not put off by the long ingredient list at all! This bread looks totally worth it...what a gorgeous recipe! Orsolya, Thank you for letting us know (and thanks for the "well arranged)! It's fixed and should work neatly again! What a stunning bread! Your braid work is beautiful. I love the sound of the nuts and spices in the filling too. I can imagine how deliciously fragrant this would be while baking. 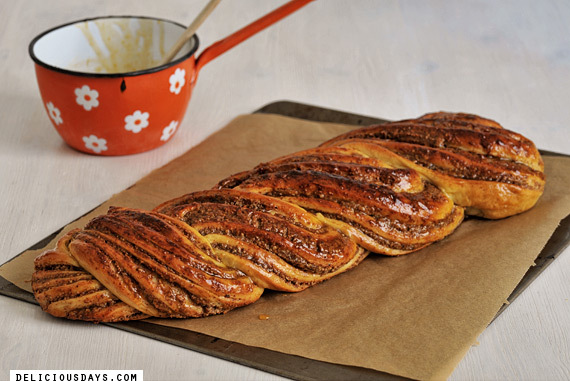 This does look gorgeous - I love this kind of braided bread. You know the filling distribution is as high as possible. This looks absolutely AMAZING! I was wondering if I can opt out of using marzipan though? Janine, yes, you can! I'd substitute marzipan with ~25 g more of the ground nuts, but really the filling is very forgiving, you can adapt it to your liking! But just so you know, I don't like Marzipan very much myself, but it adds a nice note to the filling, maybe you want to give it a try? This is definetely going to be made next weekend!! It looks and sounds just wonderful!! Wonderful recipe. It looks very tasty and I will have to try it! Since it's Thanksgiving, I'm always looking for blogs that will give me plenty of ideas. Those beautiful layers look so effective (and delicious). I think this is a little beyond my cooking skills but maybe when I'm feeling adventurous I might give it ago. Wish my braided goods looked as nice! Such a nice shape! This post looked so amazing, I HAD to try your recipe on my day off! 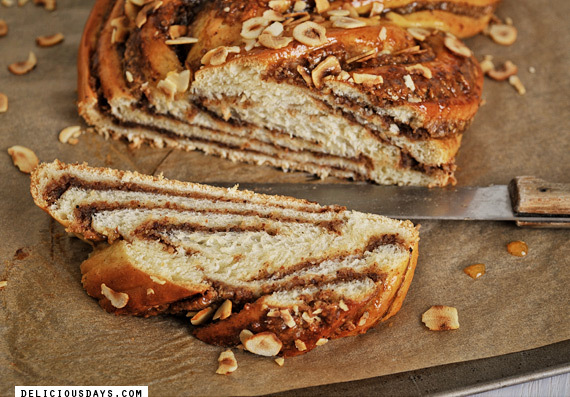 I just glazed the nut braid and can't wait to try it in the morning! Your clear directions and lovely photos really made the process quite easy. Thanks for sharing! Thank you, Angelyne. 'Hope you will like the braid as much as I do! I love reading your blog, and am very happy that you’re doing what you do… this will be next in my kitchen. Thank you for sharing. Hmmm, the loaf looks a-mazing! I love that you can see the crunchy nutty filling at a first glance. This recipe is definitely at my to-bake-list! You will miss something if you haven't done THIS NUT bread before you'll leave into space. I've had many tries before and was pretty close to give up trying to cut the bread in half and to twist it afterwards. But then THIS RECIPE came down to earth ! What a gorgeous dough and a fantastic filling. i love the pattern in the bread its amazing! looks delicious ! This is such a childhood memory for me, I want to print it and put it in a scrapbook. Then again, I'll probably rather bake it and put it in my mouth. Thanks for sharing! This looks so insanely wonderful. Thank you so much for the recipe! This bread looks ridiculously fantastic and tasty. It would make my morning and week a lot brighter. I hope I can make a batch soon! Thank you for sharing! This does look delicious. I hope to try it for the holidays. Looks amazing. Your dedication to the presentation of the finished bread is very apparent. Love your pics and thanks for sharing this! Der Teig ist am Aufgehen, und ich bin gespannt, wie der Russenzopf rauskommt. Freue mich schon auf eine Scheibe davon! Ein aufwändiges Gebäck, aber lecker! Simply gorgeous! I just discovered your blog, and I already have two "must try first" recipes: this nut braid, and Grandma Salazar's Tamales. I look forward to discovering more! Liebe Ute, dann scheinen wir eine ähnliche Kindheit gehabt zu haben ;) Ich hab auch lange rumprobiert, bis ich mit der Füllung zufrieden war...Und deshalb freut es mich umso mehr, dass dieses Rezept nicht nur mich glücklich macht!